Shiro Yoshida has fought on almost every conceivable side in humanity�s ongoing struggle to integrate mutant-kind. He has battle for and against the X-Men often enough that his loyalties are always in question. The one thing he has remained devoted to over the years is his homeland of Japan. Whatever else his motivations may be, Yoshida can be trusted always to act in the best interests of Japan. 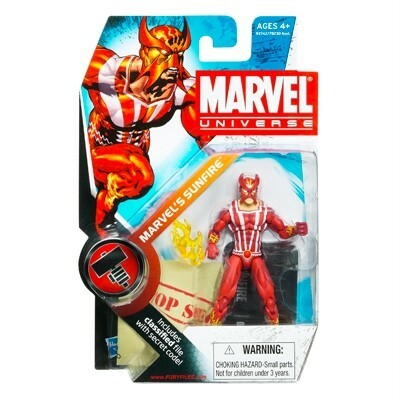 Intricately detailed down to the last muscle, this articulated Marvel�s Sunfire action figure is ready to fight! Send him into battle with his flame accessory to fight for the fate of the world or leave him posed for action on his stand as a warning against evil-doers everywhere! Figure comes with a S.H.I.E.L.D. File with secret code. Stands approximately 3 3/4 inches tall, is mint on card, ships inmediately upon payment. No Paypal? No problem, buy this same item on our Amazon store using your credit card HERE.